Before: An invitation that’s all about the arrangements. 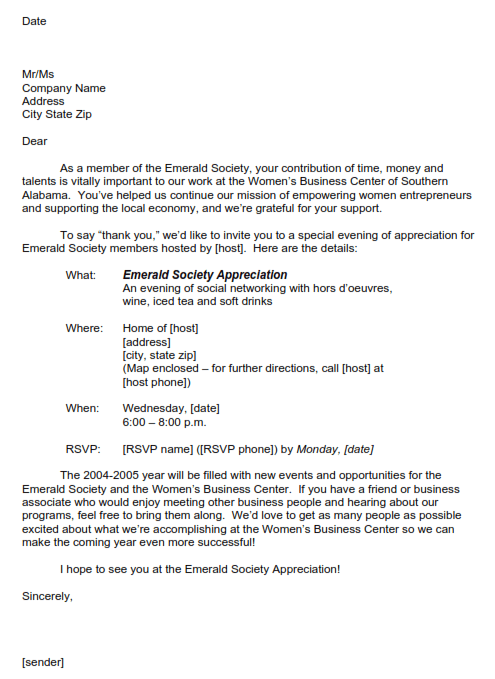 It’s a pretty common scenario: a company (or, in this case, a local non-profit) throws a party for honored guests as a “thank you” for their support. After this client had drafted their invitation letter, they knew it needed … something. But they weren’t sure exactly what. So they called me, asking if I would take a look at it. Simply put, my task was to give it just the right tone to communicate their gratitude to this special group and persuade more people to attend. When I received their draft, two things struck me. First, information about when and where the party was being held, who was invited, and whom guests should RSVP to was scattered throughout the letter. That was easy enough to fix. Second, though, was a much more subtle problem: the letter launched right into the event details, so the emphasis was on the party, not the guests. Since these were members of an elite donor group, we wanted to be sure that these guests understood how valuable their contributions to this organization were. And we wanted to encourage them to bring like-minded people along so they could “catch the vision” of this group. All in all, the letter needed to be turned on its head, so to speak, to put the emphasis in the right place (or, rather, on the right people). After: An invitation that’s all about the guests. Some of the work involved simply re-arranging information. Putting the what, when, where, etc., in a table for easy access solved the problem of details being scattered throughout the letter. Now, everything’s accessible at a glance. But the biggest change is how the letter starts: with a heartfelt “thank you” to a very special group of people who helped this non-profit achieve its mission for another successful year. The second paragraph continues by emphasizing that the party is an expression of the non-profit’s gratitude for this group’s support. And the third paragraph invites them to … well, invite more people! To quote the WBC’s Director, the changes made the letter warmer. And when you’re saying “thank you” to a special group like this, that’s a good thing. Lesson: This letter is a good example of why “who is your audience” is an even more important question than “what do you want to say.” That’s because who your reader is will dictate not only what you say, but how you say it. Here, a deceptively simple re-arrangement – saying “thank you” first – makes all the difference. Here’s a tough one – a “cold call” postcard. 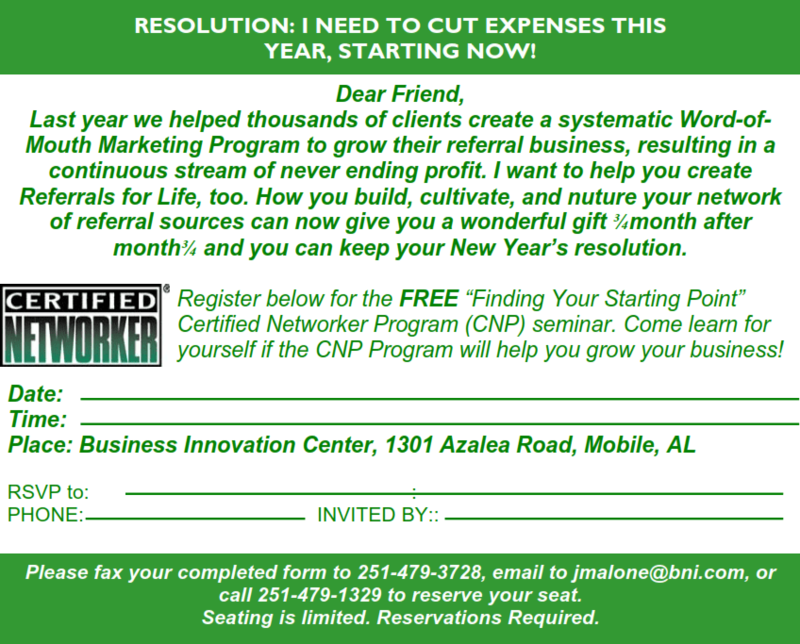 In this case, a 4″ x 6″ piece of card stock has to sell a free preview of a business networking course. It has to communicate the essence of the program concisely. But it also has to be compelling enough to convince invitees to take an hour out of their busy schedule to attend a free preview. That’s a lot to ask of such a little card! The biggest problem with the “before” card was its lack of focus. It tried to be all things to all people, but space didn’t allow that. The result was a muddied message that, according to Training Director Janice Malone, didn’t pull attendees as well as it should have. Many people don’t know how to get them, and that’s frustrating. 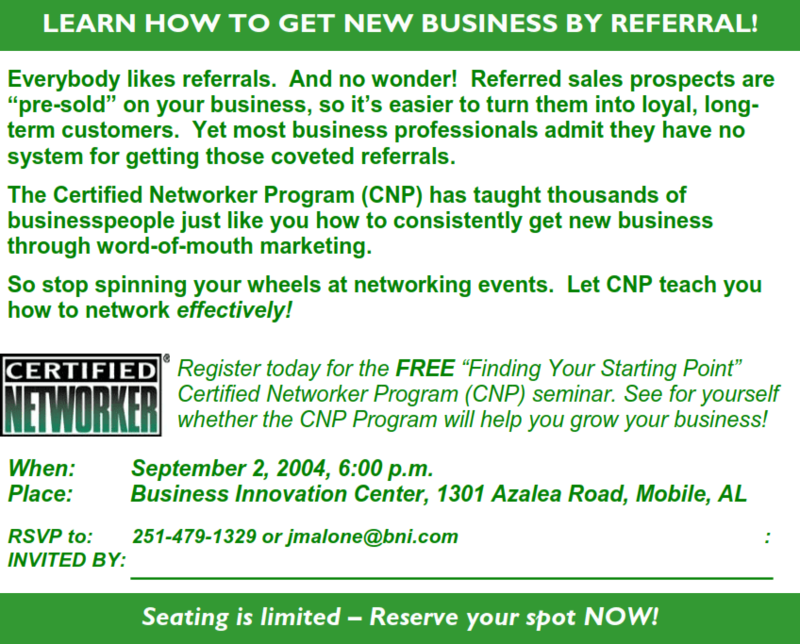 The program can teach anyone this essential business skill. The client was delighted, and starting with the first mail-out, this card has gotten much more positive response! Lesson: Don’t take a scattershot approach to your message. If you aim at everything, you’ll hit nothing. But if you zero in on the right target, you’ll be sure to strike the bull’s-eye!